The San Francisco 49ers’ new Levi’s Stadium and the APM Tunnel Extension at the Hartsfield-Jackson Atlanta International Airport are just two recent projects that called for the proven expertise and experience of the Berkel & Company Contractors Inc. team of professionals. Both projects were prominent in the public eye and both had an added level of complexity that set them apart from the average contract. Construction of the new $1.2-billion home of the San Francisco 49ers – Levi’s Stadium – began in 2006. The cutting-edge stadium features 1.85 million square feet, can seat approximately 68,500 fans and offers 165 luxury suites and 8,500 club seats. One of the more significant features of the new stadium is next-generation design, which includes a 27,000-square-foot green roof and three solar bridges (comprised of hundreds of solar panels) that connect the main parking areas to the stadium. It is expected to be the first United States professional football stadium to achieve LEED Gold certification. Another interesting feature of the stadium is the fact that it used 3,081 Auger Pressure Grouted Displacement (APGD) piles with lengths of up to 72 feet. 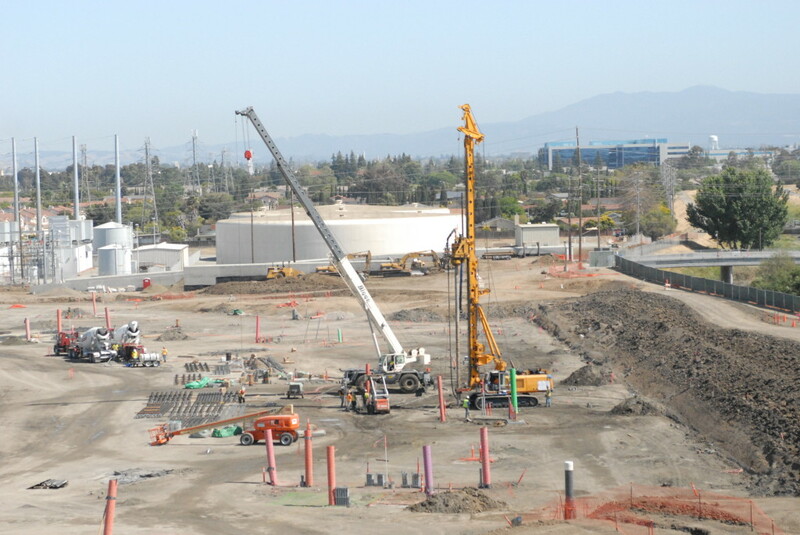 Over 3,000 piles were installed during a five-week period, using four displacement piling drill rigs simultaneously. According to Zuckerman, the piles ranged from between 55 to 72 feet in length. Installing the piles took some extra engineering and co-ordination. The auger machines were used to displace the penetrated earth, the rebar cage was put in and the hole was then immediately filled with fluid grout. The timing had to be perfect. Every APGD hole required approximately four cubic yards of fluid grout. The Automated People Mover (APM) Tunnel Extension for the Maynard H. Jackson Terminal at Hartsfield-Jackson Atlanta International Airport was a $1.2 billion expansion project that saw the construction of the new Maynard H. Jackson International Terminal. All of the airport’s international operations have been transferred to the new terminal since its completion in 2012. But the work required to make this a reality was both extensive and complex. And for Berkel & Company Contractors, it necessitated a multi-year, multi-million dollar project that put their proven foundation and shoring support expertise to the test. The APM Tunnel Extension necessitated that the APM trains, which are used to transfer passengers from one terminal to another, be extended by approximately half a mile to reach the new International Terminal. 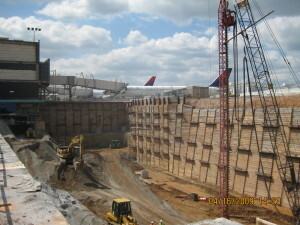 Prior to this construction project, the APM tunnel ended at Concourse E.
The project itself involved two major components. The first of these was the construction of the APM extension that required an excavation support system for a 450-foot long and 55-foot deep excavation across Taxiway Dixie. The second required a 900-foot long, 35-foot excavation beneath the basement of the existing Concourse E.
The excavation across Taxiway Dixie was made that much more complex by the fact that it needed to be done as quickly as possible. 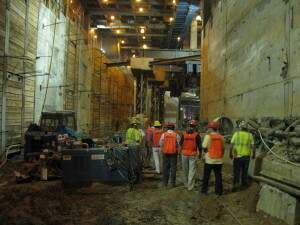 A “cut and cover” method was chosen as the mode of construction for the APM tunnel expansion. It involved a soldier pile and lagging wall with tiebacks to support the excavation. Approximately 100 soldier piles and over 200 tiebacks were installed in the wall under Taxiway Dixie. The shoring aspect of the work involved installing shoring, where possible, with a top elevation 10 feet below the finished grade to eliminate the need for shoring cutoff – a costly procedure because of the depth of cutoff required. The shoring system necessitated some demolition of the existing Taxiway Dixie before completion of the work. Additionally, the soldier piles were installed on a 10-degree batter to reduce earth pressures to allow for the use of smaller piles and fewer tiebacks. The excavation work under Concourse E was made more difficult for a couple of reasons. One, it was a confined space with limited headroom. And two, it included the exposure and underpinning of much of the deep foundations below the concourse. Hurley goes on to explain that the excavation work took place in what was initially the baggage handling area. The support system used a combined approach of soldier piles and lagging wall with tiebacks, with hand-dug underpinning piers around the majority of the 36 existing columns to minimize the number of exposed columns requiring support. “We initially planned on having to deal with about seven or eight of the original columns but we were able to re-configure our work to reduce that number to four,” adds Hurley. Shotcrete was applied to protect the existing auger-cast piles exposed during the excavation. Additionally, steel pipe piles with walers and tiebacks were installed where the bays between the columns were particularly long. The new support system included over 100 hand-dug underpinning piers as deep as 50 feet, approximately 40 soldier piles and over 400 tiebacks. 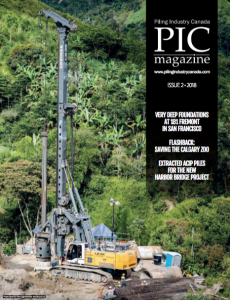 With two high-profile projects under their belt, the Berkel & Company Contractors team of professionals have solidified their reputation as a capable and versatile provider of deep foundation support systems. The company’s work on the San Francisco 49ers’ Levi’s Stadium and the APM Tunnel Extension at the Hartsfield-Atlanta International Airport have brought to the fore the company’s ability to handle projects of any size and complexity. Better yet, they have managed to bring to fruition two significant projects that will be enjoyed by North Americans for many years yet to come.